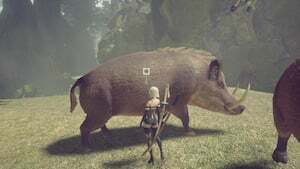 Boars are one of the Mounts in Nier: Automata. Can appear by save points once transport is unlocked. Will flee when approached unless you posess the Sachet. Drops Boar Meat, an item required for 1 quest that can be sold for gold. Also drops Beast Hide, a crafting Material.